The most challenging legal matters call for highly effective legal advocacy. 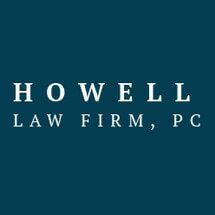 Lawyer Robb Howell of Howell Law Firm, PC, in Moultrie, Georgia, offers his clients the committed, experienced and skilled legal help they need to overcome their challenges. Personal injury — If you have been seriously injured in an accident, you know that you need access to quality medical care and financial support to help you get through the difficult times you are facing. We can help you pursue the full compensation you deserve for what you have had to go through. Medical malpractice — We can help when your trust in your doctors, nurses and the other health care professionals who provide your medical care is violated. If you received substandard medical care that harmed you, we can build a strong case that is able to cut through the complicated evidence that is part of medical malpractice cases. Employment discrimination — Have you been discriminated against at work because of your race, age, disability, gender, religion or pregnancy? Were you sexually harassed at work? We can take all necessary actions to hold your past employer accountable for discriminating against you. Business disputes — When a business dispute cannot be effectively resolved by any other means, we can help you litigate your case. Our extensive experience in the courtroom allows us to serve as strong advocates for business owners who are facing difficult situations. The Howell Law Firm, PC, understands how to help people overcome a wide range of obstacles. To schedule a free initial consultation, call 229-589-8970 or contact us online. We only collect attorney's fees in personal injury cases if we secure compensation for you.